Apple TV 6.0 update was released yesterday, bringing a firmware update that has overhauled the user experience and delivered some new features. Many of these new features tie in with what Apple announced at their iPhone event, where the keynotes talked about the introduction of the 5S and 5C, as well as the launch of Apple Radio. 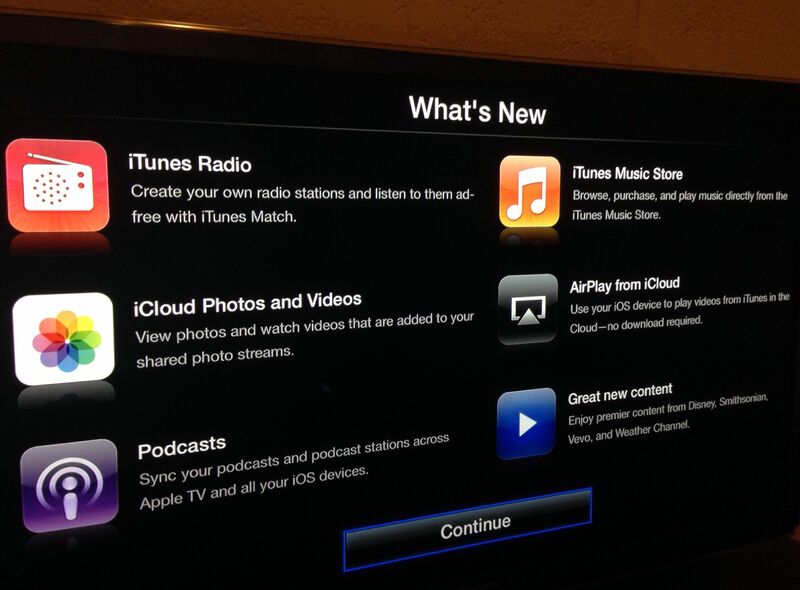 This update means that Apple TV users can now access Apple Radio through their TV sets. One of the focal points of the update is content syncing across the growing stable of Apple products. So you can now sync your podcasts across your Apple Tv as well as your other Apple devices, meaning you can now pick up where you left off. So you could begin a podcast in the gym over lunch and then finish it via your Apple TV before bed. You can now also use Apple TV to view other media, including photos and videos from other iOS devices. Finally, when it comes to aligning Apple products, the new update allows you to auto-update apps in the same way as you now can on iOS 7 enabled devices. The firmware update on the set-top TV box also allows you to browse and buy from iTunes, as well as utilising AirPlay via iCloud. The introduction of AirPlay means that you can now access your content through other peoples set-top box, allowing you to share your music whilst gathering with friends and family. Its anticipated that Apple have a big update coming in the TV space, maybe even before the year is out. Some speculation pointed at a TV update this month instead of the new iPhone, which was always unlikely. However, Apple could look to capitalise on the feel good caused by the new iOS 7 update and the queues of people trying to buy the 5S and 5C to push out their new TV product this October. October will bring the new MacBook update as well as the iPad 5 and iPad Mini 2.